Few colors are as lovely in the landscape than true, vibrant red. While red roses and carnations are Valentine icons, let’s not forget some of Eastern North America’s stunning red flowers. Attractive to you and to garden visitors such as hummingbirds and butterflies. 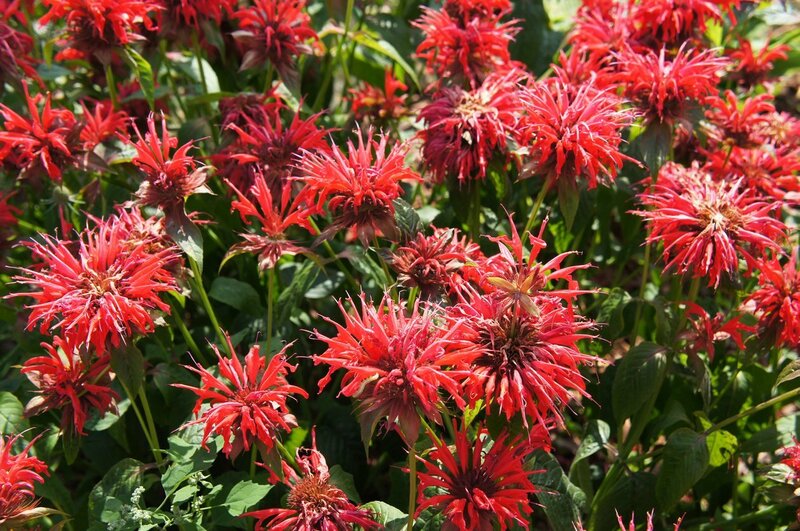 These red flowers are certain to pop in your gardens and landscapes. While it is still winter, one can plan to add these red plants this spring. Nursery open April 2. Gift cards available year round. 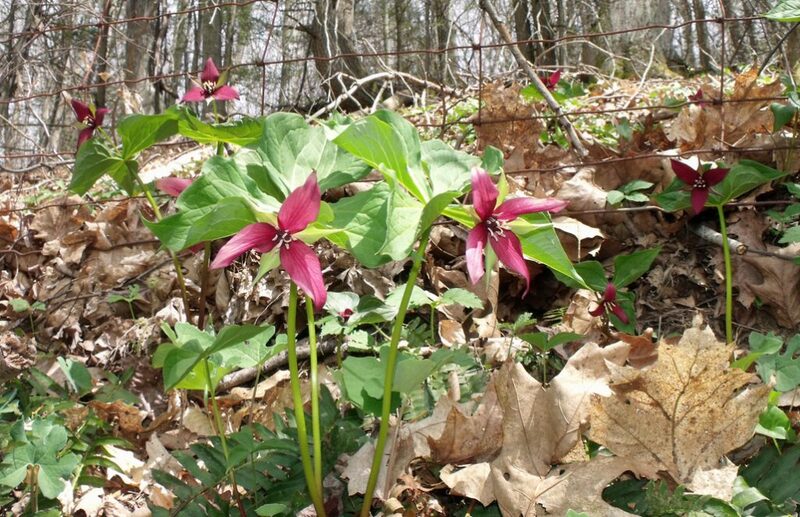 First on our list is probably the first red native to bloom, as well as one of the most sought after woodland wildflowers: Trillium erectum, commonly known as red trillium or wake robin. Three-petaled, burgundy-red flowers sit atop the broad, whorled leaves in early to mid spring. Flowers can last up to a month, before forming fruit. Wildlife will eat the berries, and early pollinating insects visit the blooms. An ephemeral species, after the fruits mature, the plant slips into dormancy, withering by mid-summer, only to emerge again the next spring. This plant prefers growing in rich, moist soil in full shade to filtered shade. Over time, this plant can spread and form patches in the garden. Another spring bloomer, Aquilegia canadensis, known as Eastern red columbine, makes a beautiful addition to the garden. Blooming from mid-late spring, the clover-like leaves, often with a purple tinge, are topped with little hanging flowers reminiscent of lanterns. They are red with yellow centers, almost making them appear as if they are glowing. The earliest arriving hummingbirds, as well as bees, butterflies, moths, and other insects visit the blossoms for nectar. Blooming can last for well over a month, sometimes much longer. This species prefers full sun to part shade, moist but well-drained soil. It will tuck its roots under rocks or flagstone, making it a great addition to retaining walls or rock gardens. Will spread about by seed. Beginning to bloom around the same time is Silene virginica, better known as fire pink or scarlet catchfly. This small plant generally grows 1’-1.5’, but it surely makes a statement. Ideal for average to dry, well drained, sandy or gravely garden soils in full sun to part shade (afternoon shade preference). This species is often short-lived in the garden, but will readily reseed if planted in the right spot. And, even if it doesn’t, its short-lived time in your garden will be a memorable one!. Hummingbirds really love this one. Like other Silene species, you will notice its interesting habit of trapping tiny insects on its sticky stems. 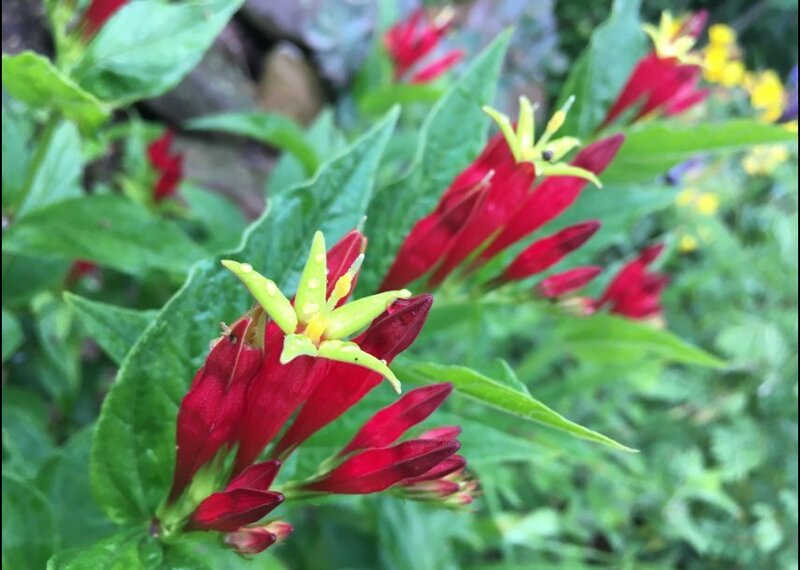 Perhaps one of our most strikingly unusual native perennials, with a tropical appearance, is Spigelia marilandica, often called Indian pinks. Blooming from late spring to mid-summer, this plant produces cymes of red, tubular flowers with bright yellow centers. Though truly a native just south of Pennsylvania, this plant is still part of the greater mid-Atlantic ecosystem and is hardy to USDA zone 5b. Best grown in average to moist, well-drained soil in full sun to part shade, this plant works great tucked in with complementary flowers such as Coreopsis species and Iris versicolor, or mass planted. Hummingbirds will relish this one, too. 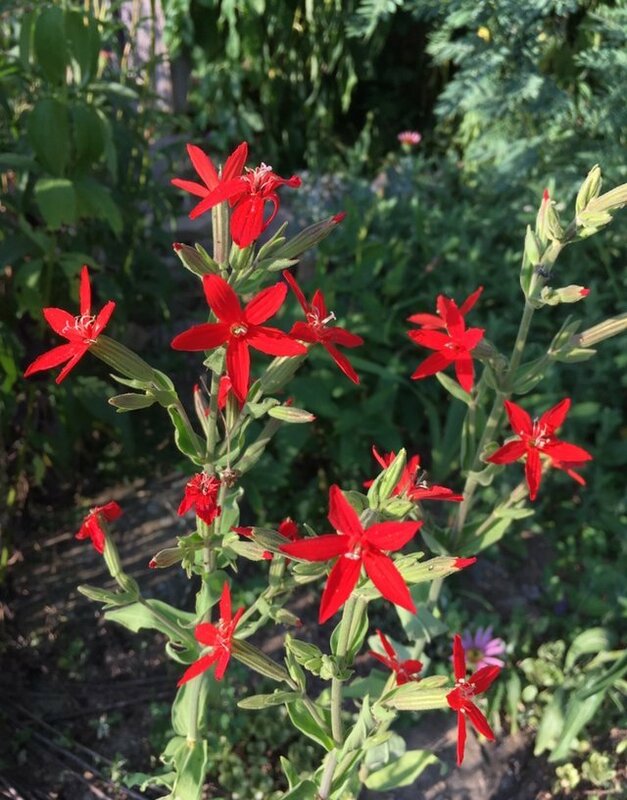 The taller, and more robust cousin to fire pink, Silene regia, commonly known as royal catchfly, is perhaps one of the most visually striking red flowers. 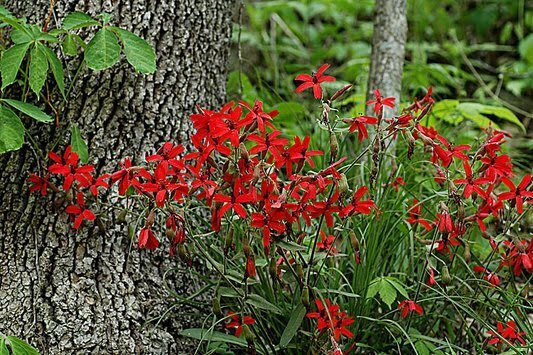 The five-petaled, vibrant, scarlet red flowers can be spotted from a distance among other plants in mid-summer. This is a grassland species, native to the mid-west, as far as east as southern Ohio. Most of Pennsylvania’s native grasslands were converted to agriculture quickly after the colonization of Europeans, so perhaps this species did occur in western Pennsylvania at one time. Hummingbirds will visit this plant, along with butterflies and bees. The stems of this plant are stronger and stickier than the stems of the closely related fire pink, and tiny insects can be found stuck all over it. There is speculation that this species could one day evolve to have carnivorous tendencies and absorb nutrients from these trapped insects. There is no evidence that the plant can currently utilize the insects it traps. This species thrives in full sun, grown in average to dry, well-drained soil. Complementary flowers include Echinacea purpurea, Monarda fitsulosa, and Rudbeckia sp. Another mid-summer bloomer and our tallest native red-flowering perennial, Monarda didyma, commonly called scarlet bee balm, sports large red flowers atop 3-4 foot stems. Blooming persists mid to late summer. It is one of the best flowers for attracting hummingbirds. A member of the mint family, it produces fragrant oils that can be smelled if the leaves are clipped or crushed. This species prefers full sun in average to moist garden soil, and it can even be planted in wet soils. It has long, spreading roots that send up shoots each year to form a dense colony. The roots are very shallow and easily removed if it spreads more than desired. There are several cultivars of this species, including mildew resistant strains. Finally, a flower so red it was named after our reddest native bird. 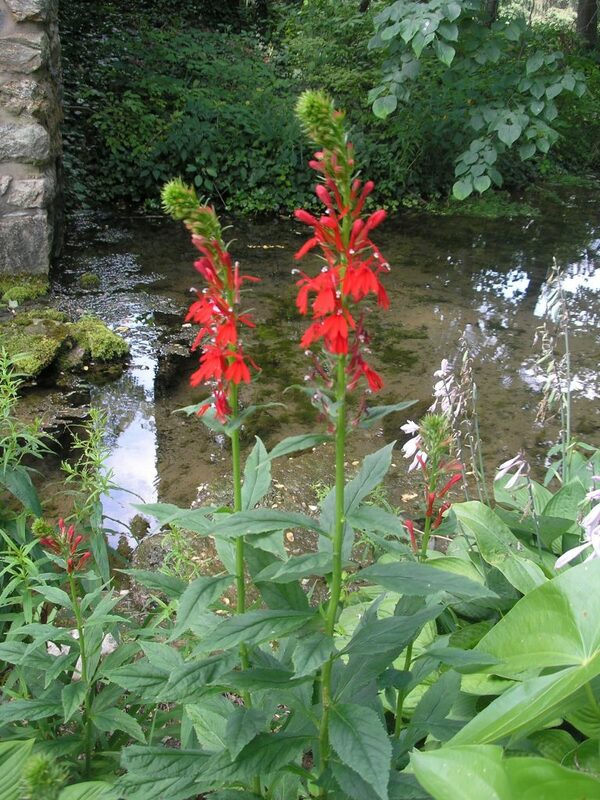 Lobelia cardinalis, the cardinal flower, is one of our true treasures from the wetlands and streamsides of our region. 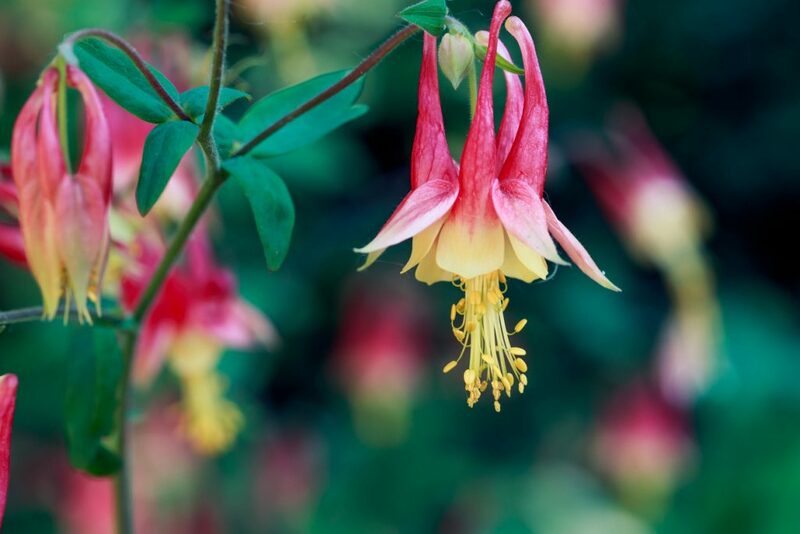 Though naturally found in wet soils, this beautiful plant can be grown in moist garden soil. It is often short lived in the garden, and seems to last longest in moist soil that is shaded from the hottest parts of summer days. This is yet another great plant to observe hummingbirds feeding, as well as bees. Blooming begins in the late summer and can last until early fall; flower stems reach anywhere from 1 to 3 feet tall, and sometimes even larger. The plant will benefit from watering if it is not in a moist location. Ideal for use in a shallow pond, container, or bog garden. Everything we did to go native paid off in the amount of wildlife our yard attracted!